Kolkata’s Mutton Tikia, the meaty delicacy! “Dada please pack one Mutton Tikia and two Rumali Roti. I want extra gravy too”; It was the regular order by the teenage girl I was fifteen years back. With the pocket money I used to receive, One Tikia, Two Roti followed by one Khirkodom or 100g Bonde were all I could afford for the evening snack that too once a week. Tikia had always been love, however, the gravy was lust! Palm-sized, rough outer-crust ( if I at all call it outer-crust); Tikia aka the Mutoon Tikia was the School-time mate for me! I used to came back from the tuition classes with an earthen pot (bhnar) half-full with the Kebab like thing, dripping in Oil (or Vanaspati) along with a few Rumali Roti. Who have thought that there are people possess the same emotion for the meaty Tikia and especially for the gravy! Then there’s Tanmay’s Tweet 🙂 . In fact, his tweet was like a kick. It reminded the entire School and college time, the limited pocket money and the days of having the first few roti’s with just the “Tikiar Jhol” (the gravy). During my college days, when spending each rupee implied a thorough ROI calculation, Saima’s Mutton Tikia was the real deal. Would easily have minimum five Rumali Rotis to go with a plate of Tikia. Coming to the favorites, mine is a small joint at the crossing of Surya Sen Street (Guest Snack Bar) which according to me sells Kolkata’s best Mutton Tikia. You may differ though, after all, there are known joints like Saima or Zeeshan for selling Tikia. Mehebub for that matter differs and he is in favor of Saima’s Tikia and so is my friend Tanmay. Last night, I and Mehebub were discussing Tikia. Mehebub asked me to define Tikia given one who has not tasted it may confuse it with the sophisticated Shammi Kebab. He almost chocked the vodka he was sipping! “Debjani don’t tell me you still read those shits! Mills and Boon! Really! “Woman for the sake of your readers, a normal definition if you please!” my man requested and I obliged ;)! Flattened Meaty disk lightly very very lightly (mark the emphasis on “very) in a thick gravy is what Mutton Tikia for you. Not as sophisticated as Kebab, yet a known and signature meat delicacy from Kolkata. 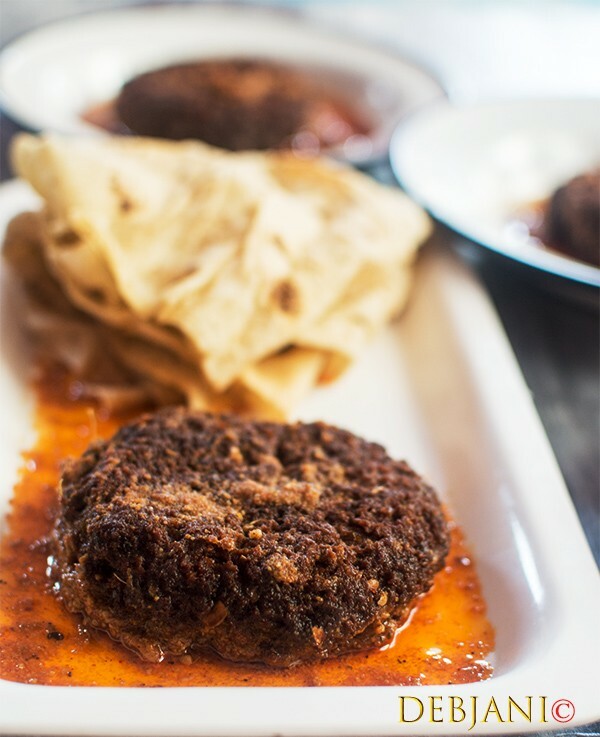 Almost a similar form is available in Bangladesh as well and they call it Tikia Kabab. Even the Murshidabadi Muslims are known for a similar dish. However, in both the cases, they don’t toss it in a gravy and that makes Kolkata’s Mutton Tikia different. The outer crust of Tikia is rough while the disk is super-soft as a whole. The meat inside is buttery soft and is subtly spiced and is characterized by the use of Chatu/ Sattu. 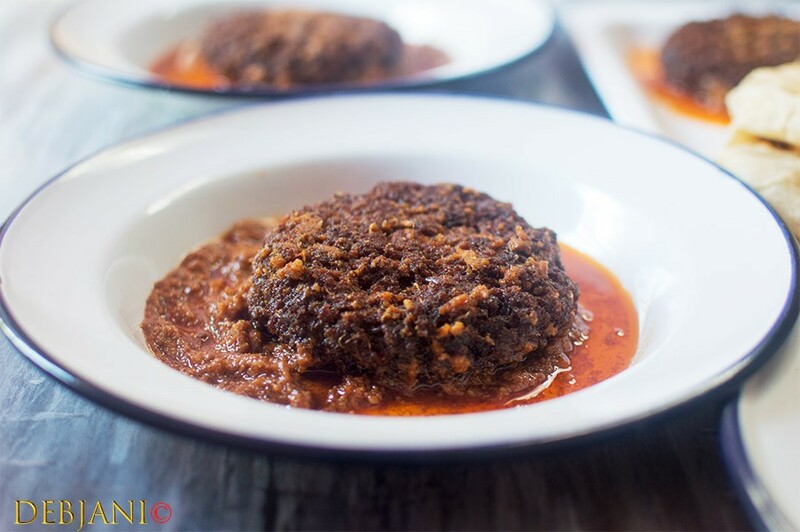 Coming to the recipe of Kolkata’s Mutton Tikia, it calls for Mince Meat and Cholar Dal (Bengal Gram) along with Chatu (Bengal Gram Flour) along with a few spices. 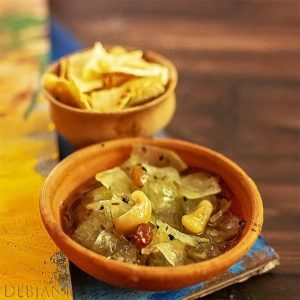 The gravy is a thick one and is prepared with a dash of Chatu again. 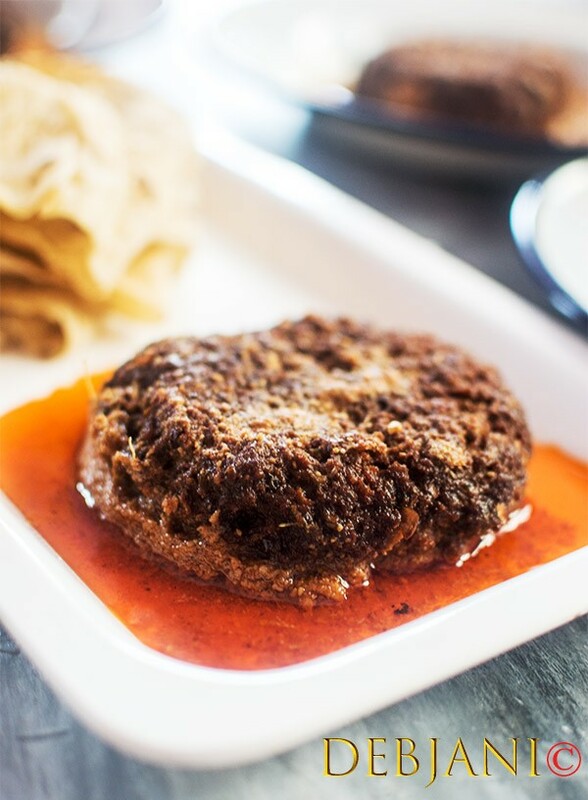 Here’s is how you make it and in case you don’t want to Make Mutton Tikia at home, you can order it from the nearby locations through Swiggy. 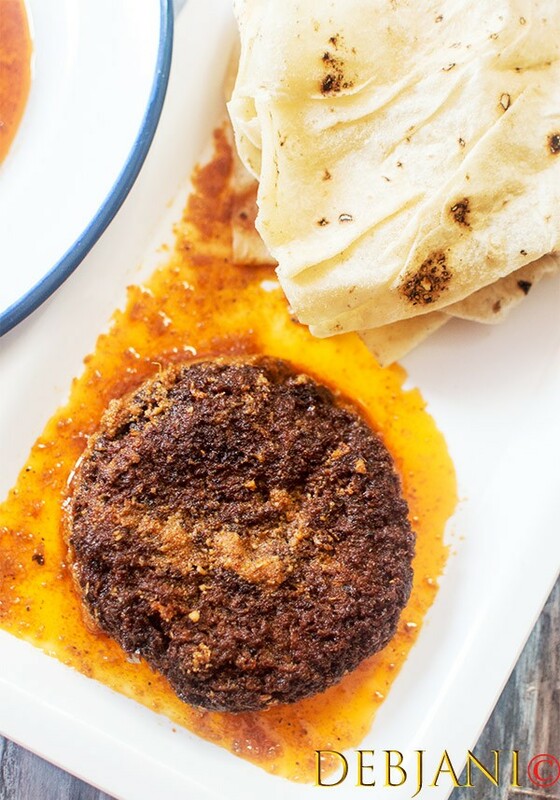 Mutton Tikia is a famous meaty kebab from Kolkata comes with gravy. Green Papaya Paste: 1 Tbsp. Green Chili Paste: ½ Tsp. Sattu/ Gram Flour: 2 Tbsp. Mellon Seed Powder/ Charmagaj: 1 Tbsp. Kashmiri Red Chili Powder: 2 Tsp. Wash Mince Meat/ Keema and drain the water. Marinade the Keema with Green Papaya Paste, Onion Paste, Ginger Paste, Garlic Paste, Lemon Juice, Green Chili Paste, Kashmiri Red Chili Powder, Garam Masala Powder and salt overnight or at least for four hours. The meat may release moisture after few hours. Take a few spoonfuls of the liquid from the meat mixture and keep that aside. Grind the mixture using a food processor/ or mixer-grinder in medium speed for 20 seconds. Dry roast the Gram Flour aka Chatu. Now add gram flour to the mixture in batches until the mixture is sticky and can be shaped in form of a disk. Keep 1 Tsp. gram flour in reserve. If the mixture turned stiff, add the liquid preserved. Make palm-sized disks from the mixture and brush each with little oil. Heat the oil and ghee in a flat pan and keep the flame on the lower side once the oil is sufficiently hot. Keep 1 Tbsp. Oil in reserve. Sprinkle Gram flour over the disks. this will help to create the rough outer crust. Now place the meat disks over the oil and keep some gap in between. Shallow fry the meat disks and brush with oil in between. The flame must be on the lower side. Dry roast the Gram flour in a pan until it emits a nutty aroma. Now heat the oil along with Ghee in a Flat pan. Temper the oil with Dry Red Chili: 1Cinnamon Stick, Clove, Black Cardamom, Green Cardamom, and Black Peppercorn. Add Onion Paste and cook till the onion turned light brown in color. Now add Ginger and garlic paste and cook for a minute. Add roasted Gram Flour and mix thoroughly. Add Mellon Seed Powder/ Charmagaj, Garam Masala Powder, Kashmiri Red Chili Powder, salt, and Mawa. Cook till the oil leaves the edge of the mixture. Add lemon juice followed by the Keora water to finish the gravy. Place fried Tikia and cook for 4-5 minutes. Using a spoon scoop some gravy and pour over the Tikia. Tikia is a delicate thing and hence calls for attention. Mawa is optional however makes the gravy rich. The gravy calls for extra oil. You may reduce as per taste. Instead of Chatu/ Sattu, Besan will not work! If not available make a coarse powder of Bengal gram, Pigeon Peas (Arhar Dal/ tur Dal) and chickpeas. Take all the lentils in equal quantity. Use a flat pan While tossing the Tikia with the gravy. The delicate Tikia calls for attention else you get the soft kebab intact and that is, believeme, very unfortunate!. 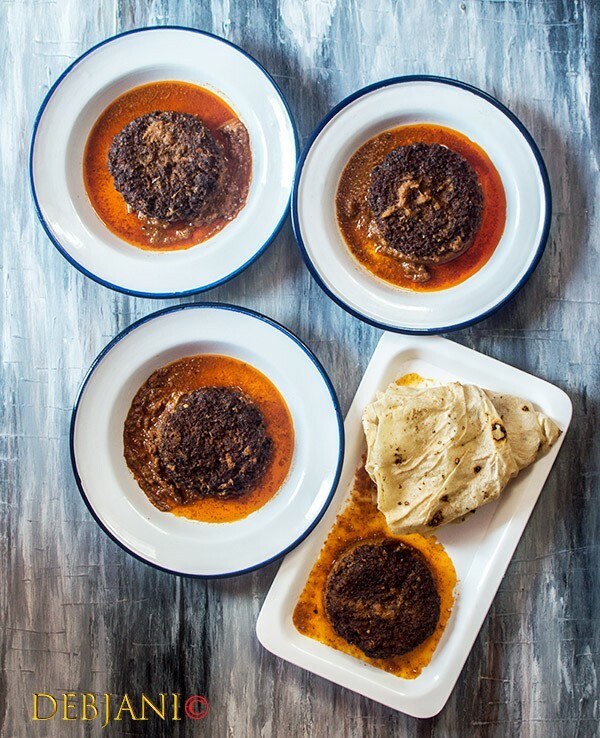 Have you tried the Kolkata’s Mutton Tikia Recipe from Debjanir Rannachar or have similar memories! Do let me know how it came out if you tried it at home. Also, I would love to see a picture of the same which you can share here on dolonchttrj@gmail.com. On Instagram you can use my hashtag #debjanirrannaghar or you, in addition, you can tag me at @foodofdebjani. You can follow me on Facebook, and Twitter, Pinterest, and Instagram for updates and recipes from Debjanir Rannaghar. Furthermore, I would love to receive recipe requests and would try my best to come up with more recipes or the experiences.